Incredible Views of Crystal Lake! The Schubery sits on the south shore of Crystal Lake, shaded by the bluff behind. 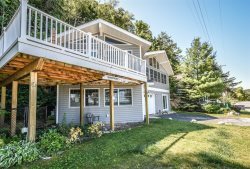 Across the road from the home is 200' of private waterfront with a small sandy beach, fire pit, and sandbox area. Enjoy some of the best views of the Lake from inside the home or outside on the spacious deck. Stored in the walk-out basement, you'll find a canoe for a spontaneous trip around the lake. Or, grab the bikes and take a ride down to the Crystal View Cafe for a tasty treat! Wood for the firepit is also stored in here to keep it dry for the emergency marshmallow roast. This unique tri-level home offers a large floor plan for guests. From the walkout basement, you will take the steps to the first level. At the top of the stairs, you will find the full bathroom with a space heater to take the chill off on a cold morning. To the left, you’ll find the first two bedrooms, one with a twin over twin bunk bed and the other with a full bed. The second level is the Great Room, the main living area. This room offers the best view of the lake from inside. Large windows and sliding glass doors span the front of the cottage. Open the sliders and let in the amazing lake breeze! For the warmer days, the row of windows above the kitchen offers a natural cooling system. The open floor plan has a spacious kitchen overlooking the living and dining areas. The living area offers two sofas and a rocking chair. Sit back and relax while watching tv or enjoying a fire in the woodstove. Off the main living area, you will find a wrap around deck with plenty of seating. The views from this deck are some of the best you will find on the lake. The deck itself has open railings so make sure to monitor little ones when enjoying the space. Up the stairs, to the third level, you will find another full bath and two more bedrooms. The larger room with queen bed offers a view of the lake. The smaller room with a twin over twin bunk bed has a loft with a ¾ mattress. Please keep in mind that the loft ladder is narrow and works better for older children or teens. Across the street, you'll find 200' of waterfront with a sandy beach area and a 90' dock. A small sandbox for the little ones is a short distance from the water for a little added playspace and safety. With a long dock, the Schrubery is great for boats, too! Don’t forget to bring your mooring system. Parking is extremely limited. Please notify Crystal Vacation Rentals if you will have more than 2 cars. Super easy and thank you for the payment extension.